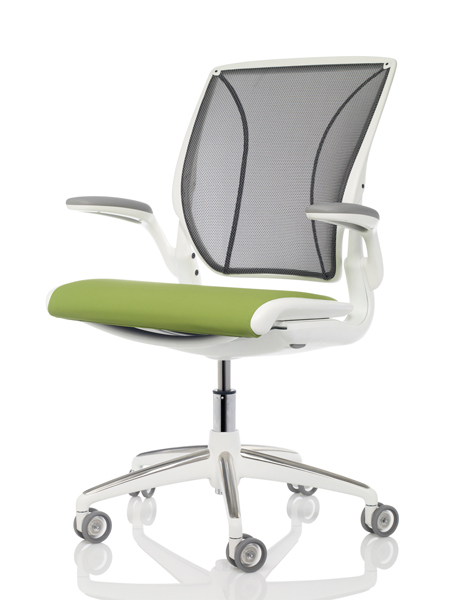 Back Care Basics is proud to offer this All Mesh version of the popular Humanscale Diffrient World Chair. Offered in two of Humanscales most popular mesh patterns with three frame colors including a hard to find white. This model Ships Free and can be custom built for you in 14-21 days. This video highlights the many design features and logic that was built into this revolutionary chair. Please take a minute and watch if you would like to know more! Self adjusting recline regardless of user size and weight. Pivoting backrest during recline automatically adjusts to the changing needs of the spine. Tri-panel non stretch mesh back creates body fitting contours and self adjusting lumbar support for a custom fit. Size adjustable to fit more than 95% of the population. Seat height and depth adjustable. Carefully sculpted seat cushion matches your bodies contour. Modular seat and backs that can be replaced if needed. Injection molded, structural, integral color plastics with die-cast aluminum frame. Standard 3" heavy duty casters or optional no charge special soft casters for hard floor surfaces. Dash mesh seat and back foundations in Platinum or Zinc. Black, white or gray frames. 24/7 rated for users up to 300 pounds. 15 Year Warranty. 5 Years on the fabrics and foam. Frameless front seat edge eliminates contact stress under the thighs. Arm height from seat 6.77-9.41"
Fits users from 5' to 6'4" (100-300 lbs). Lowest seat height setting is perfect for those with small frames. Ships Free in 14-21 Days! Back Care Basics is an authorized Humanscale retailer. If you have seen any product that we do not list or need a modification to one that we do show please contact us @ 800.858.8987 for assistance and a quote. Recycled content: 20% pre-consumer, 2% post-consumer. We work to extend the life of our products through both design and engineering so they won’t need to be replaced often. Ships in packaging that contains recycled content or blanket-wrapped, when feasible.